Just seven years after the First Amendment was passed as part of the Bill of Rights, John Adams’ administration passed the Sedition Act of 1798, an extreme piece of legislation that made criticism of the government and its leaders a crime. Punishment included heavy fines and jail time. From a loudmouth in a bar to a firebrand politician to Benjamin Franklin’s own grandson, those victimized by the Sedition Act were as varied as the country’s citizenry. 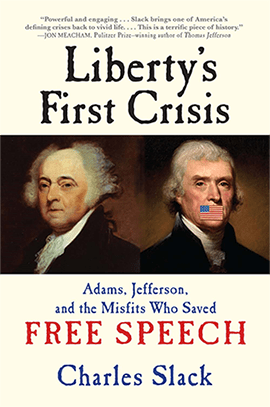 Liberty’s First Crisis vividly unfolds pivotal events in the early life of the United States when free speech was so soon challenged, and the Founding Fathers and Americans struggled to define and preserve the freedoms they had fought so hard to establish. For those who think that partisan conflict is a cable-driven 21st-century phenomenon, Charlie Slack has written a powerful and engaging narrative that puts things in perspective. By plunging back into the 1790s, Slack brings one of America’s defining crises back to vivid life, reminding us that democracy has always been the tenderest of flowers. This is a terrific piece of history. Imagine a novel in which a band of hard-drinking, street-fighting, badass rebels take on the rulers of a powerful new empire, risking everything in a struggle that will determine the fate of American freedom. Then imagine that it’s not a work of fiction but the history of the early United States and that the villains attempting to impose a tyrannical regime on Americans were some of our greatest national heroes. Present this riveting, little-known, but painfully relevant story in the prose of a master storyteller and you have Charles Slack’s Liberty’s First Crisis. This is a story about the true meaning of freedom, how America’s founding fathers wrestled over it, and how it nearly slipped through their (and our) grasp. Deeply researched and cogently analyzed, Charles Slack’s Liberty’s First Crisis molds the dramatic events swirling around the Alien and Sedition Acts of 1798 into a mesmerizing, uniquely American tale—complete with fistfights, insults, canings, and rigged courts.Most importantly, it underscores the high-minded reasoning, the courage, the sacrifice needed to achieve that most fleeting and invaluable of human conditions: freedom. Slack has created an indelible story. Charles Slack plunged me right into the cauldron of the 1790s, when politics was personal, personalitieswere larger than life, the First Amendment was an untested idea, and no one knew what kind of place the United States might turn out to be. Liberty’s First Crisis is like being there, and it makes me marvel anew at the miracle that Americans wrought. Fantastic characters, vibrant storytelling and a hugely important message for our time. When I reached the last page, I wanted to stand up and applaud. Slack’s heroes took up residence in my imagination, where I’m sure they’ll remain. I will be recommending this book far and wide. Though picking your favorite book is sort of like picking your favorite child (you love them all) this one has special meaning to me. For one thing, it’s been the longest in gestation, nearly four years from when I began researching my proposal until publication. Beyond that, Liberty’s First Crisis deals directly with a subject I’m passionate about: the First Amendment and free speech. For as long as I can remember—certainly, long before I published my first piece of writing—I’ve been intensely proud to live in a country where the most powerful leader has no authority to tell the least powerful citizen what he can or can’t say. So I’d always been curious about that brief moment in history—1798—when the United States government decided to make criticizing elected leaders a crime. What were they so afraid of? Weren’t these the same men who, seven years earlier, had enshrined free speech as the first right in the glorious Bill of Rights? What were they thinking? And, who were the victims of this law? What I found as I began to research was an extraordinary cast of characters. It was a chance to tell a great story, while at the same time exploring a subject fundamental to our lives. The victims were a varied and fascinating lot, ranging from a favorite grandson of Benjamin Franklin to a sitting U.S. Congressman, to an average citizen who got drunkone day and made an offhand joke about the president in front of the wrong crowd. And, at the center of the story, there was the embattled president himself, John Adams, feeling threatened by any number of enemies, foreign and domestic. In his younger days, Adams had been among the most forceful and passionate voices on the subject of free speech. But as president he, like nearly every powerful leader before him, rounded up his critics and tried to forcibly silence them. Americans came to their senses in the nick of time. Alarmed by the sight of fellow citizens being thrown in jail for expressing their opinions, Americans woke from their sleep and realized that precious liberties were at stake. They rejected the Sedition Act and swept the Federalists who had passed it—including President Adams—out of office. One of the things that most excited me about this book was that the story is so relevant to our own time. The Sedition Act may have been the first great test of free speech in the United States, but it was in no way the last. In one way or another, we’ve been fighting the battle to preserve this most precious liberty ever since. My hope is that in looking closely at the conflicts that took place so long ago, we might find parallels to our own time, and find ways to avoid going down the same path. We tend to frame these debates in political terms—right against left. But in truth the enemy we need to stay on guard against is our own desire to make the world a better place by shutting objectionable voices down.